So as the giant media conglomerates continue to watch their kingdoms crumble, and the self-styled scribes of truth chronicle their every misstep and blunder, the rest of us will continue to vacuum up their former readers and advertisers. We’ll continue to grow. We’ll continue to adapt. We’ll continue to profit. And we’ll do it all while upholding the standards of journalism that make newspapers so important. And therein lies the future of newspapers – one that’s not so gloomy for everyone. I think every newspaperman of the period prior to 1990 would have noted that the news business is about people. To those who built all of the “newspapers” owned by the corporate media conglomerates we see crumbling today, I bet this was obvious. Thank goodness we still have some of those types around, and can expect to see a recycling of newspapers, starting with your local community press. Anyhow, I think the future of journalism is more important than the future of newspapers. 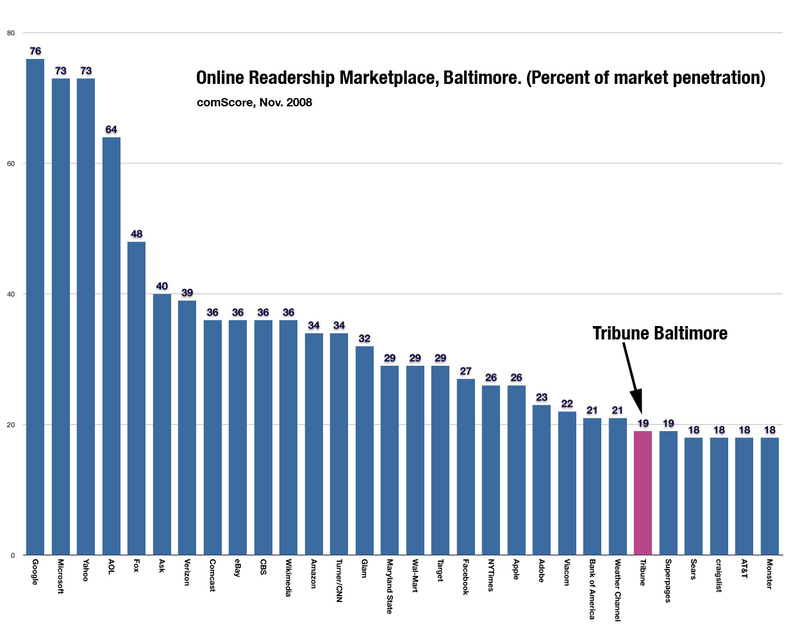 The future of the newspaper industry in an online world is this: http://www.niemanlab.org/images/trib-chart.jpg. How can you compete for online advertising dollars? Instead of one or two metros monopolizing advertising spend in each city, a news website is up against the worldwide web. I think the real issue for the newspapers is their capital requirements. It costs lots of money to print content on paper and then deliver it to your doorstep. To cover those costs, higher and higher percentages of their pages are covered with ads. I’m afraid recently we see the papers drastically cutting the rates they pay for content or just picking up the bulk of their content from wire services – so good writers are flocking to the web taking their audiences with them. I really wouldn’t want to buy stock (inject more capital) in a company that is real good at printing and delivering paper! In terms of recycling – my favorite is the puppy’s cage. Gotta go now – plenty of good blogs to read! ‹ Coupon Websites: Coupons, Discounts, Promos, and more Coupons!